Located in Red light district in the center of the city, the 800 year old Oude Kerk is the oldest building in Amsterdam; Oude Kerk became cultural institution in 2012. 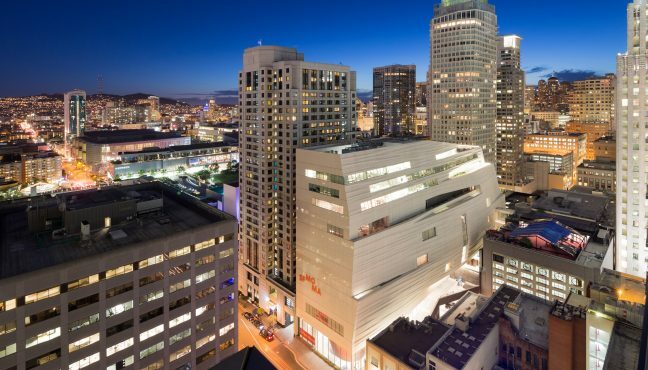 Since then, it hosts exhibitions of contemporary art and public programs related to them. 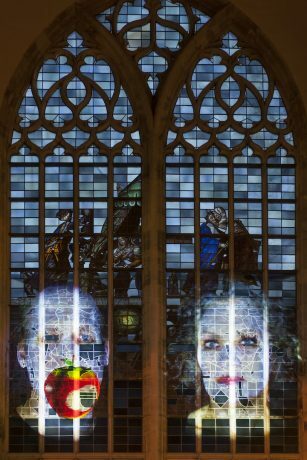 Museeum interviewed the director of Oude Kerk, Jacqueline Grandjean, and talked about the history and program of the church and about the way contemporary art fits in the space of 14th century monument. 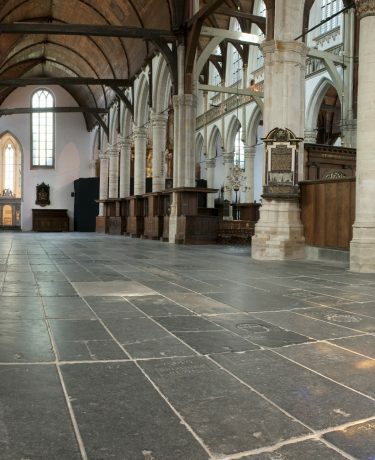 Nowadays Oude Kerk has dynamic cultural program, but for many centuries it used to be a church. 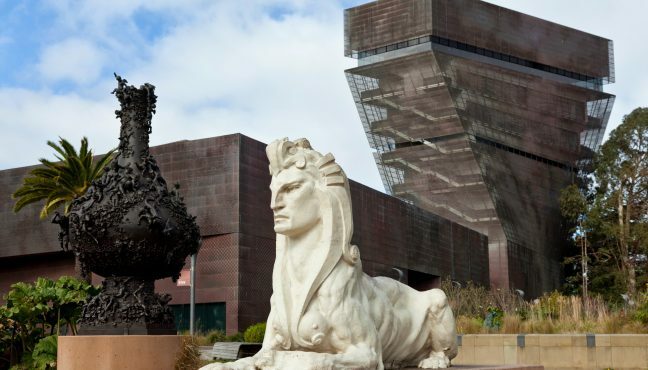 When was the cultural institution founded and how did it happen? 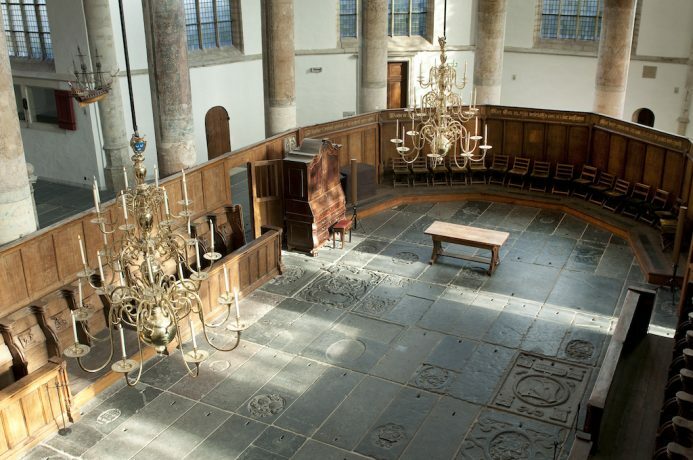 Oude Kerk is both oldest building in town and the newest art institution of Amsterdam. 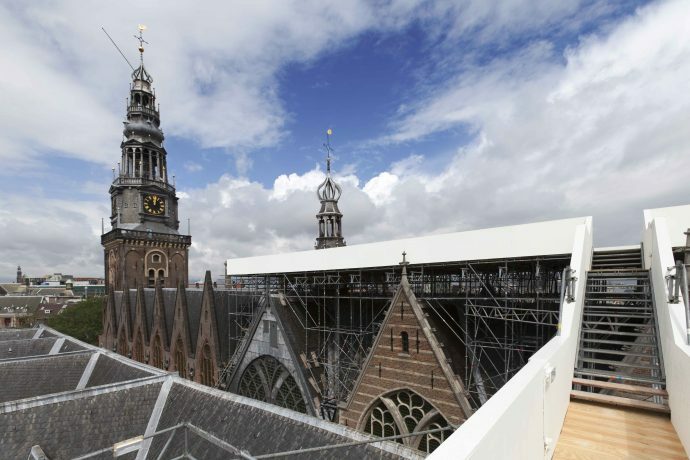 Starting in 1950 the roof of Oude Kerk collapsed and no one was all to enter the building. No surprise as during World War Ii many churches were demolished and neglected. 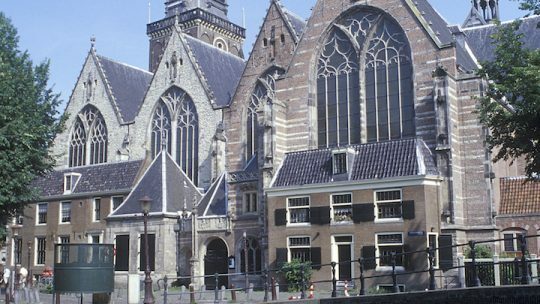 The Protestant church, unable to handle the necessary restorations, decided to sell the building to the newly established Stichting de Oude Kerk foundation. A massive amount of work was done, from the rooftop to the grave stones inside the building, below which more than 22,000 Dutch were buried. Along with the restoration, a large amount of research was done revealing details about the names of those buried, the interior of the church, as well as the ceiling and decoration. One such stunning revelation was the ceiling that had been previously covered in grey paint, under which were beautiful images meant to reside above the alter. 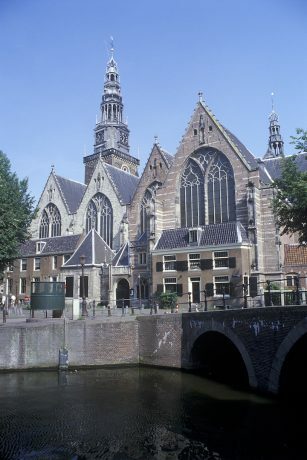 The church was founded in 1306; in 1566, Oude Kerk faced the year of Iconoclastic Fury, a term used for outbreaks of destruction of religious images that occurred in Europe in the 16th century. 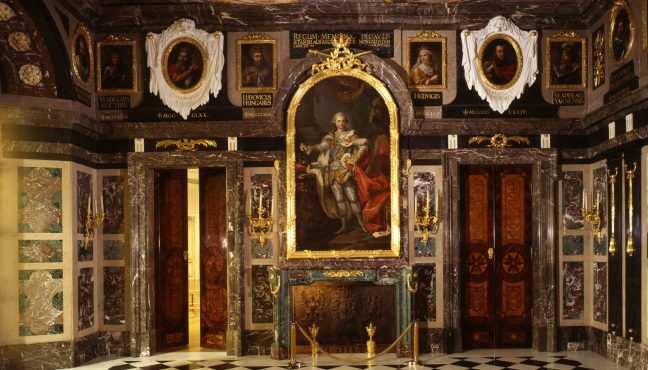 During these periods of iconoclasm, Catholic art along with church fittings and decorations were destroyed by Calvinist Protestant crowds as part of the Protestant Reformation. Before that, the church was Roman-Catholic, and after it became a Protestant church. 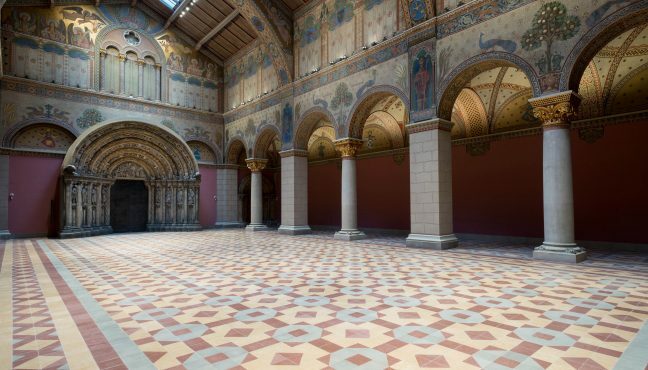 The space was rented out for a long time as money was needed for the restoration. During that time the image of the Oude Kerk was unclear. People were confused about what was going on. For some years World Press photo took place in the space, and from time to time there were parties and private events. 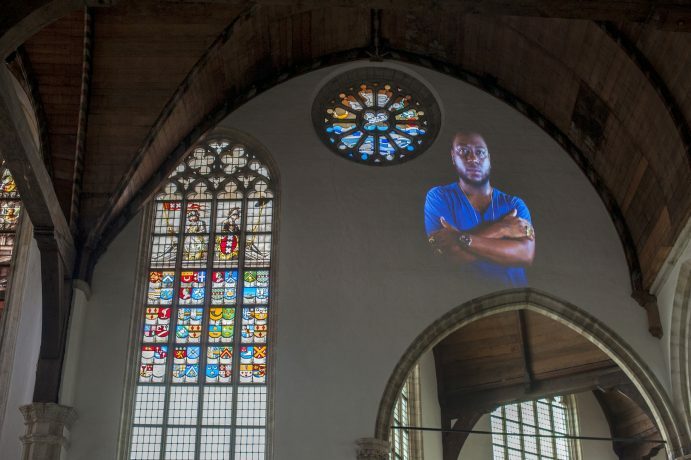 The Stichting de Oude Kerk foundation decided that contemporary art would be the future of Oude Kerk, since it connects both present and future and is itself full of historical context. It is through this historical context that the artists are inspired and can fill the space with their work. 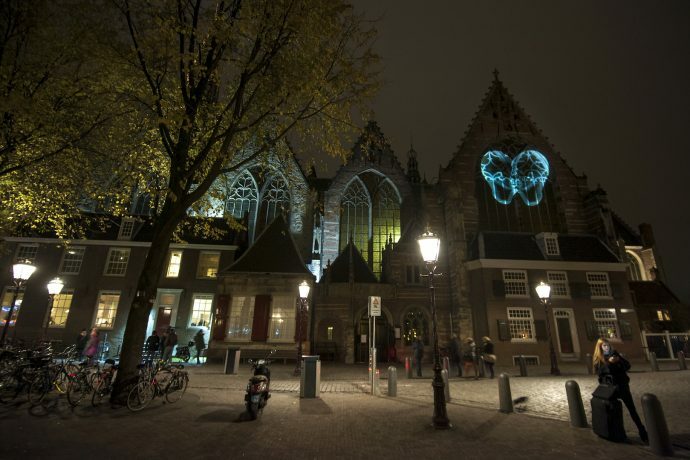 The church is located in the Red Light district, adding to the controversy and layers of historical significance. The first artist we worked directly with was Tony Ousler. I was a bit hesitant to ask him to participate, as the space is difficult to ignore and complex, as wells as being full of meaning and at times dominant over the art. Ousler agreed to be a part of the project along with other various artists. They all said yes to the complexity and challenge. 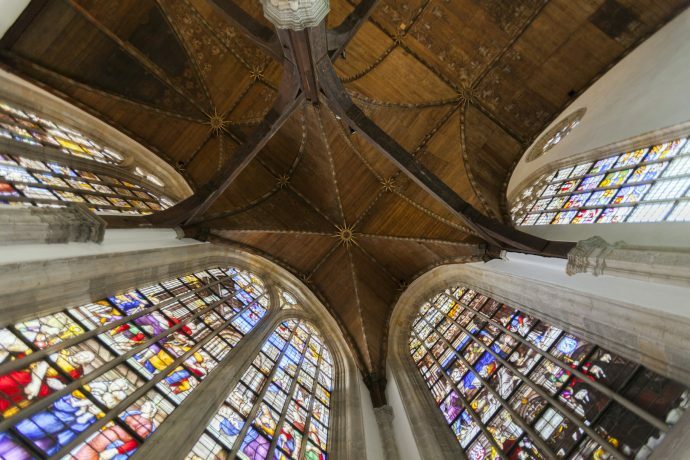 It is for this reason that we enjoy working with artists who are further along in their careers and who have more experience dealing with difficult architectural contexts like Oude Kerk. 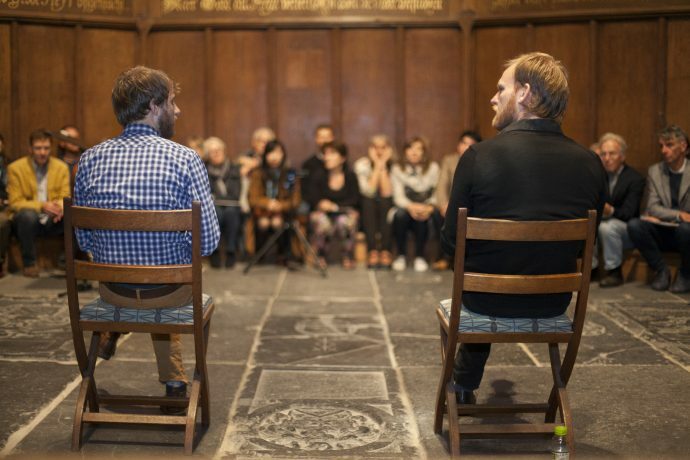 At the same time we also ask artists who are just beginning their careers and who enjoy participating in performances or short term projects like the “Nachtelijke Dwalingen”, processions which start in Oude Kerk and continue in the Red Light district. I like the combination of these two types of artists. Usually we ask for 1.5-2 years of preparation of an exhibition. The concentration you need in order to make work for this building is quite high. It is always new work, and it is always commissioned work, often by an international artist. In preparation for the exhibits research also needs to be done. We have a library with books and archives, which might be interesting for an artist to have a look at. Of course the most important thing is the building itself. This process takes a while. It’s slow curating here. You need time. And if you take time, something special will be produced in the collaboration with an artist. New projects are always surprise for the public. Taturo Atzu had two ideas for the project, we developed one of them. One idea was to build a toilet inside one of the chapels. He wanted to build a toilet around the big chandelier. So you had a private toilet, which was fascinating, because you had huge chandelier inside of it and at the same time it was secluded from the rest of the space. And that’s what he does. 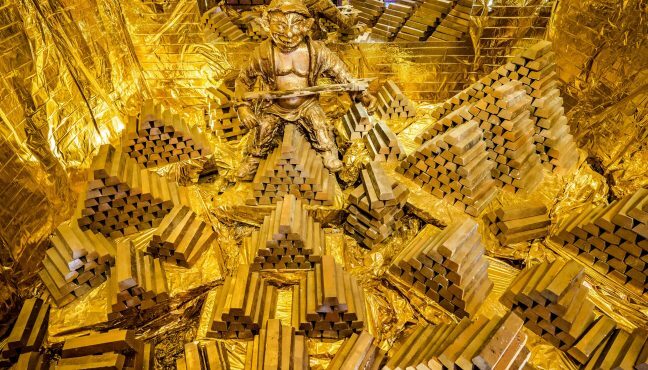 He isolates a part of the monument or heritage into a new piece of art and he evokes the public to look at it in a different way or from a different angle. 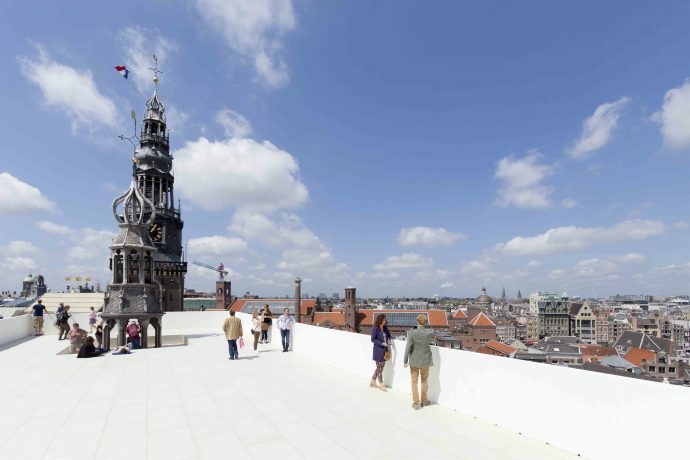 In the project “The Garden which is the nearest to God“, which he did for the Oude Kerk, he secluded the angel on the rooftop. 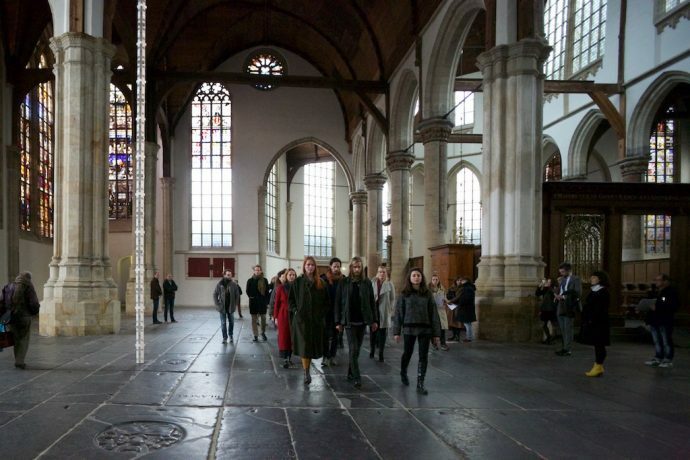 At that moment we thought that Oude Kerk has earned its place on the cultural map of Amsterdam. It was an iconic work by Taturo Atzu. Germaine Kruip did her project in a completely different way. Taturo Atzu’s work was more like a take-over, where Germaine used the space quite subtlety. Some of the visitors might not even see it. But if you are open to it, it fills the whole space: the organ is playing all day long, mirrors are reflecting the light, the column is almost there to stay, and the all artificial light has vanished. We feel sad that the installation has to leave, because over time it has become part of the building. You truly manage to combine heritage and contemporary art. I can hardly name other institutions, who are working on it in a similar way. 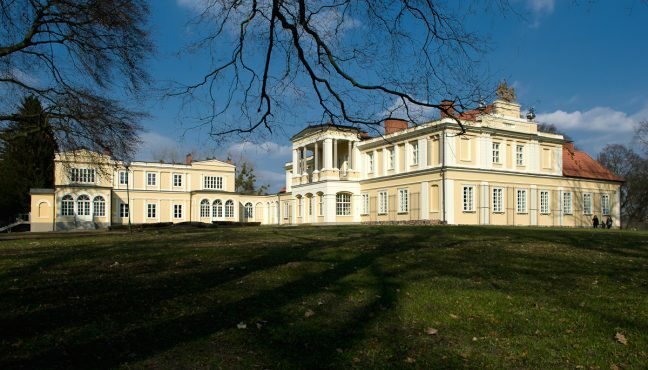 We have some similarities with Vleeshal in Middleburgh, museum in Paris, Musée de la Manaie. We also feel like colleagues, though they are doing it in a different way, with Castrum Perigrini. I think there is a new kind of movement and I also see that the artists (from Sandberg Institute) are fascinated by the rich context we have here. 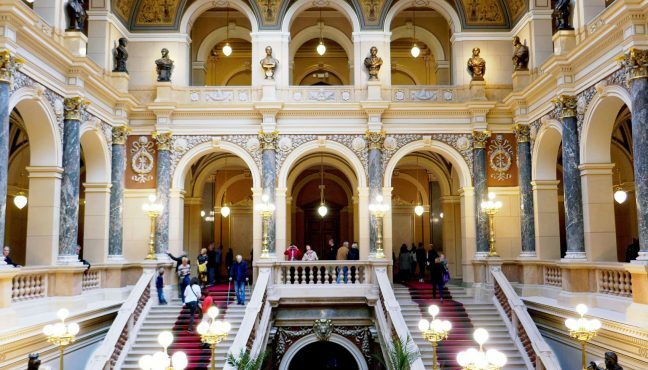 I wasn’t expecting that there would be so much interest in diving deep into history and cultural time layers, of which this building has many. I think it reflects the period the art is in right now: performance art, timeless art, and research based art. Those ways of approaching art do relate quite well here. There is also the urge of an artist to be more involved in the context than ever before. Maybe we’ve started in the right moment of time. 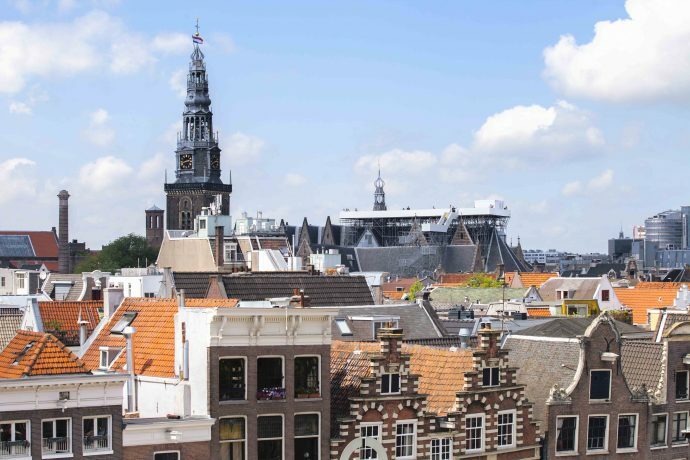 What is the general mission statement of the Oude Kerk? The strategy and the policy of the institution. 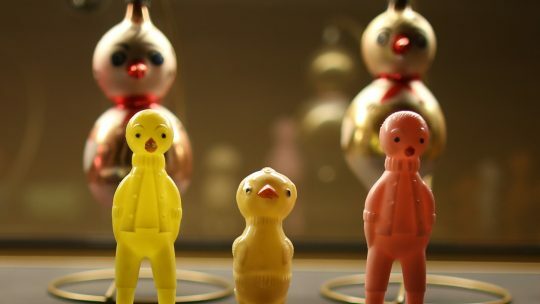 We want to bring together heritage and contemporary art. Often one of the two is excluded. I always thought that there is an ongoing dialogue between the two of them. How can one exclude part of history or not embrace the “nowness” of the future. Why is it separated? I think that this building is capable of bringing it together again. 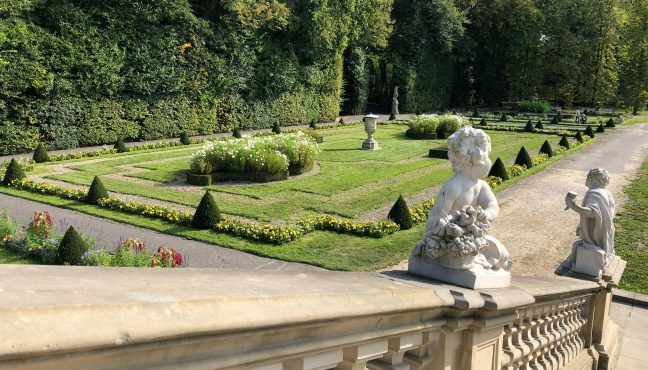 I hope we can get awareness of the public, that there is a strong connection between the past and the present. And if you look at them, you can even see the future. 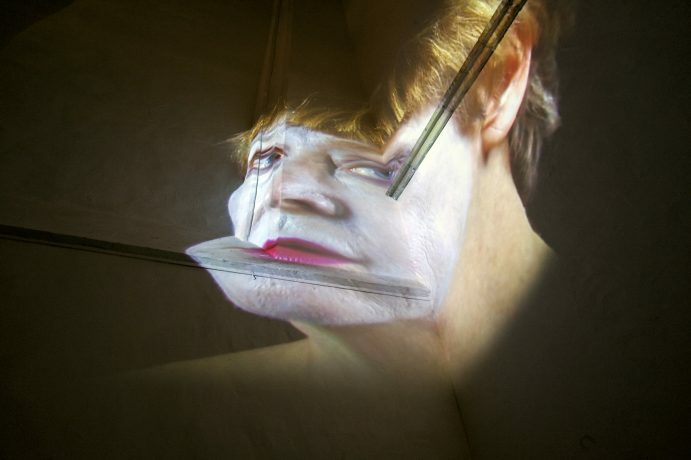 We make people aware that contemporary art is the heritage of tomorrow. It is something to think about in the space of Oude Kerk. This building is designed to reflect and to ask questions. This is what art does and this is what religion does, reflecting on life, on the world around you. It is the prefect interconnection between the two of them. Do some religious activities still take place in the church? Every Sunday there is a service. The Protestant church was the previous owner of the building, and when they sold the space to our foundation they made an agreement about Sunday services. It is part of the contract. Of course often art and religion are in a difficult dialogue. They both give meaning to the world around us, but from a whole different perspective, and the discussion between the two of them can often be quite tense. Young artists get interested in reflecting on religion in different ways. The people who come to church ask different questions than the ones our usual audience asks. Art is patient enough to consolidate all these different questions. At the same time art is here to ask questions, not to give answers. We are existing next to each other, we are looking at the world through different windows. This also reflects our Amsterdam culture, which is quite open-minded, and capable of tolerating different meanings and opinions next to each other. Although in past few years things have been tense, I hope we as a nation can still be proud of our open-mindedness and that we can hold on to tolerance. How big is the team of Oude Kerk? Do you collaborate a lot with freelancers? We are 7 full-time people, of course we have a lot of support from freelancers. We collaborate often with freelancers have worked with us long term. 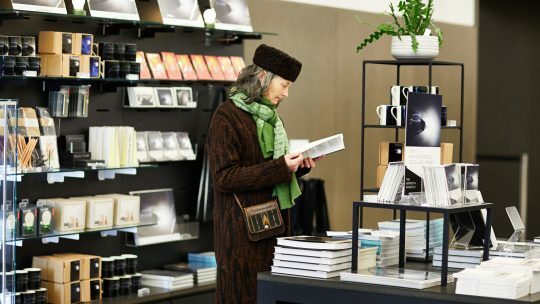 We have been working with Non Fiction (http://non-fiction.eu/ ) since 2013. 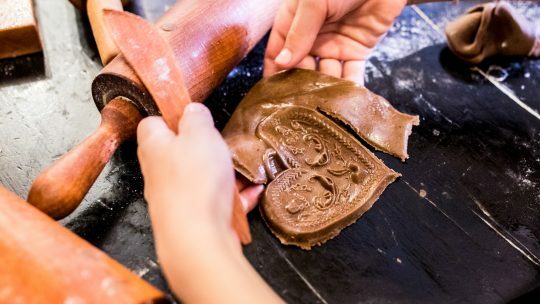 Exhibitions are designed by the team of Oude Kerk and the artist. Sometimes we invite guest curators. The title of the public program is “Come closer”. Every exhibition has 4 “Come closer” evenings, where we ask younger artists, people from different disciplines (theatre, dance, etc.) temporary to be part of the exhibition and to embrace the public in a different way than the exhibition does and it works out very well. 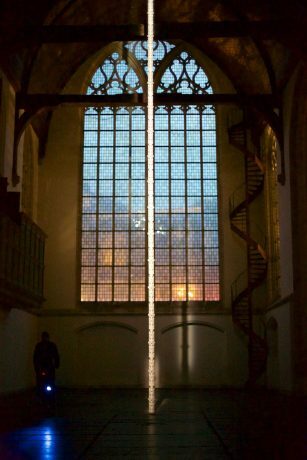 Do you think that the context of the Oude Kerk make people reconsider the way they perceive contemporary art? 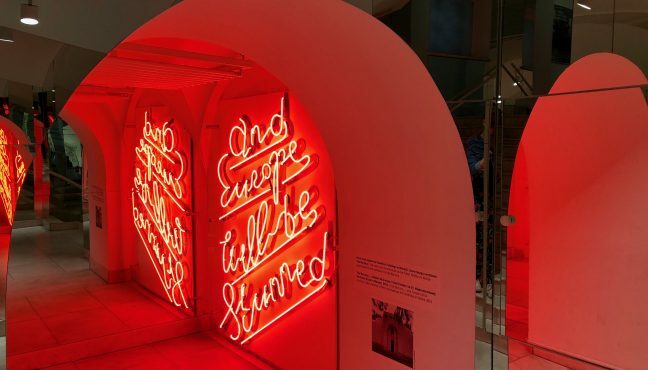 For some people it’s difficult to understand contemporary art, but maybe the context of history and heritage helps them somehow. There is a complete new public, different from the one visiting institutions of contemporary art. Many people would prefer not to go to a contemporary art exhibition at all. But they are here. They might be surprised or puzzled or fascinated. 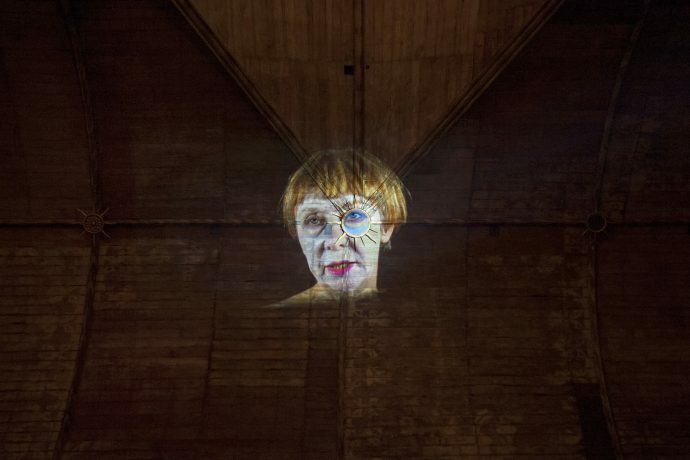 Some people get angry that there is contemporary art in church. They think it is inappropriate. We always explain our reasoning and open the dialogue for conversation. Whether you like it or not, there are two kinds of reactions: people completely love it or they fundamentally hate it. Therefore the impact of our program on society is quite strong. Because it doesn’t leave the space to neutral attitude. Of course visitors, who are interested in heritage, need more guidance. We have texts and mediators. 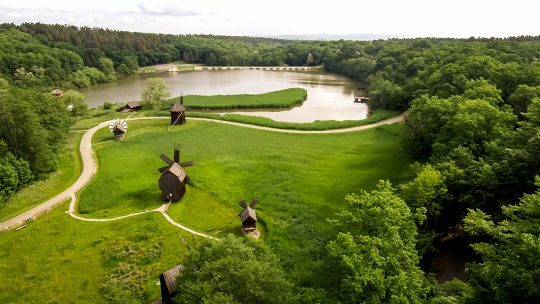 During the upcoming exhibition “Once in a lifetime” we have the whole program with walks through the exhibition space. It’s a group exhibition and eight artists are participating. So the audience will need an introduction and a discussion. That is what the Oude Kerk is all about.